What Is Percutaneus Vertebroplasty ? It is a minimally invasive procedure use to treat patients who suffer from painful vertebral compression fractures, not responding to conservative therapy. Vertebrae are the bones of the back, which join together to make up the spinal column. In a compression fracture of the vertebrae, the bone tissue ofthe vertebral body collapses. More than one vertebra may be affected. 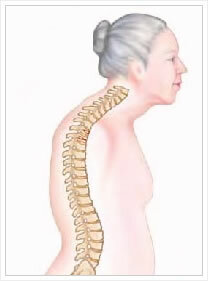 This condition is commonly caused by osteoporosis and less often by tumor, or trauma to the back. When the fracture occurs as a result of osteoporosis, the vertebrae in the thoracic (chest) and lower spine are usually affected, and symptoms may become worse with walking. With multiple fractures, kyphosis, a forward hump-like curvature of the spine, may result. Pressure on the spinal cord may occur producing symptoms of numbness,tingling, or weakness. Symptoms depend up on the area of the back that is affected. In some cases, the fracture heals without treatment and the pain goes away. In others, the bone does not stabilize and continues to move, causing persistent pain that in turn limits physical activities and reduces independence. Historically, patients with compression fractures have been treated with conservative treatment including strong pain medications, prolonged bed-rest, or external bracing. These treatments can result in long recovery times and disruption of daily life. Vertebroplasty is an option to failed conservative treatment for vertebral compression fractures. This minimally invasive procedure is performed by specialists including interventional radiologists, neuroradiologists, surgeons and pain management physicians using x-ray guidance to accurately place specially formulated acrylic bone cement. Read “How the procedure works” for more details. 1. Vertebral Compression Fracture, causing pain and deformity. 2. A biopsy neelde is guided into the fractured vertebra through a small incison in the skin. 3. Acrylic bone cement is shown flowing into the vertebra, filling the spaces within the bone. 4. Restored vertebra with bone cement, stabilizing the vertebral structure and relieving pain. Usually the procedure is performed under intravenous sedation with local anesthetic supplementation. Oral medications are also available to assist with relaxation before and during the procedure. You will be taken to the procedure suite, place in the fluoroscopy bed lying on your stomach. Blood pressure and cardiac monitors will be applied. Next, your upper or lower back area will be scrub and cleansed in a sterile fashion. With the aid of an X-ray guidance, which provides constant imaging (called fluoroscopy), the vertebral fractures are identified. The physician will then inject a small amount of local anesthetic in the skin and deeper tissues to numb the area. This may be associated with mild and brief stinging sensations. Once the area is numb, your doctor will make a small nick in the skin, then insert a special needle into the appropriate fracture vertebrae, under x-ray guidance. A biocompatible bone cement is injected through the needle into the vertebral body. The needle is then removed, and the cement allowed to hardened (usually within 10 minutes). The small skin nick is covered with a bandage. The whole procedure takes between 30 minutes to 2 hours (depending on how many vertebrae are treated). You will go back to the post anesthesia care unit, where you will be monitored for 30-60 minutes after the procedure. Typically, most patients resume normal activities within 24-48 hours. Some patients experience immediate pain relief after the procedure, others may take up to 48 hours. Post procedure instructions will be given in a pre-printed form. A follow up appointment will be made for post procedure evaluation in approximately one week. Medications will be given for the post -operative period which may include a muscle relaxant and an analgesic/anti-inflammatory. The post procedure discomfort is usually minor and can be manage with ice packs and medications.